Local Attorney and Cryptocurrency Expert Elaborates on the Future of Blockchain. 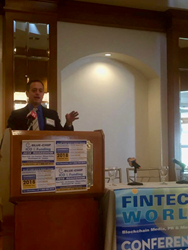 Jon Frutkin speaking at Fintech's Blockchain event on March 5 in Los Angeles. We must learn to broaden our understanding of currency in the modern age and the possibilities that exist so that Arizona businesses don’t get left behind. During the last year, there has been an explosion of conversation about the rising and falling price of Bitcoin as well as the invention of hundreds of cryptocurrencies. Is this the latest tulip craze? Or is there something more happening that will transform our lives in the way the Internet did a generation ago?